Our recent Journal Series of James travel to and from Guinea prompted some comments and questions from those who are new to Nazareth House Apostolate. One such comment came from a kind lady who was "googling" the words "guinea pig" and came up with our blog. Ha Ha! I love the strange ways people find us. Anyway, seeing the photos and reading James' struggles of the trip kept her on the blog and prompted her to investigate Nazareth House further. In a series of emails, she questioned about how we were able to "do what you do" in Sierra Leone while operating out of USA. "It seems that an organization would have to be in the country and area in which they serve" she said, "The logistics, the energy spent must be incredible being across the ocean" she continued. This was my perfect opportunity to explain that we are doing just that...trying to establish permanent residency in the area in which we serve. 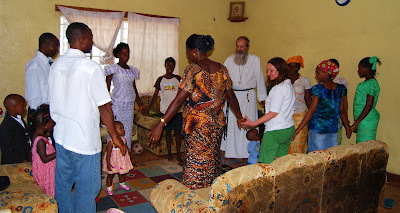 I explained that we are able to do as much as we do because of the team work between Nazareth House, Freetown a.k.a. St. Laurence House and Nazareth Houses in America. We are more than a working team, we are a family, a bond. Through James, Kadijah, Lucy, Ann Marie and even little Roo, we, as Nazareth House, are able to deliver provisions and hope to those in need without ever leaving home! You know James and Kadijah, because there is a relationship, you care about them, you love them. Conversely, they know those involved in Nazareth House from America as if they are their own family, they love you. Everyone is giving every thing they have (prayer,talent, money, time) to make it happen ....but without a compound we are limited. Once we own our Operations Center and are free of the rental insecurity, we can expand and branch out to fill more cracks with the provisions that they so desperately need. It is imperative for us to provide housing for our staff, store the supplies that we distribute to the needy (including medical), give accommodation for those coming to immerse themselves in the mission field, an most importantly offer a much needed home for the terminally ill - a place to spend your last days without being alone and homeless. Death is a constant IN YOUR FACE reality in Sierra Leone, most are left to find it without any comfort. "Wow", she replied "I certainly didn't expect to be drawn into the needs of an African country. I really didn't even know anything about Sierra Leone when I typed 'guinea pig' into the Google Search Engine!" "I was looking for ways to aid a sick guinea pig."